Zvezda’s description of the mission mentions two Tu-95s flying from the Engels airbase in southern Russia but doesn't offer the exact date. Lossiemouth reported intercepting two “Bears” on January 30, although it could have been one of many other encounters between Russian bombers and UK jets over the North Sea. The latest happened on Thursday. 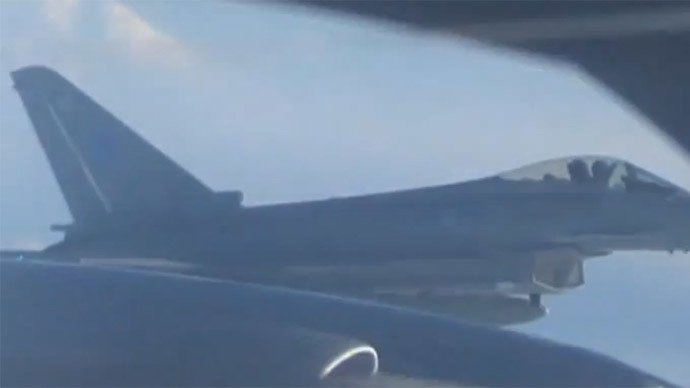 The video features a rare view of Tu-95 coaxial propellers apparently rotating at very low speed with its blades seeming to be banding. It's actually an optical illusion. The blades are actually spinning so fast that their tips break the sound barrier (the reason why Bears are among the noisiest planes in the world). The blades rotate a full circle in the time it takes for a camera’s shutter to act and take a frame, making them appear to be almost immobile. The Tupolev Tu-95 is a four-engine, long-range bomber designed to carry nuclear-capable cruise missiles. They are part of the Russian nuclear deterrence force.